Vectorize your images into scalable and clear art! Auto vector converts photographs and images into scalable vector files. Vector-based graphics appear smooth at any size or resolution. Auto Vector does the conversion automatically, you don't need to do any manual tracing. Just load an image, set the level of details globally and (optionally) locally and the vectorized image is ready. 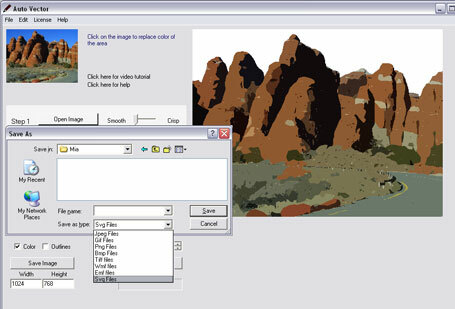 The output can be saved as a vectorized photo or can be simplified to a cartoon-like vector drawing. The output formats include svg (Scalable Vector Graphics), wmf (Windows Metafile) and emf (Enhanced Metafile).